Today was a day of transport. To begin the Annapurna circuit, I needed to get to a village just north of Besishahar. Everyone warned of the road to Pokhara from Kathmandu, with good reason. It is paved and two lanes, but just barely, and it winds through narrow mountain edges with an unbelievable amount of heavy traffic, everyone passing each other on sharp narrow turns. 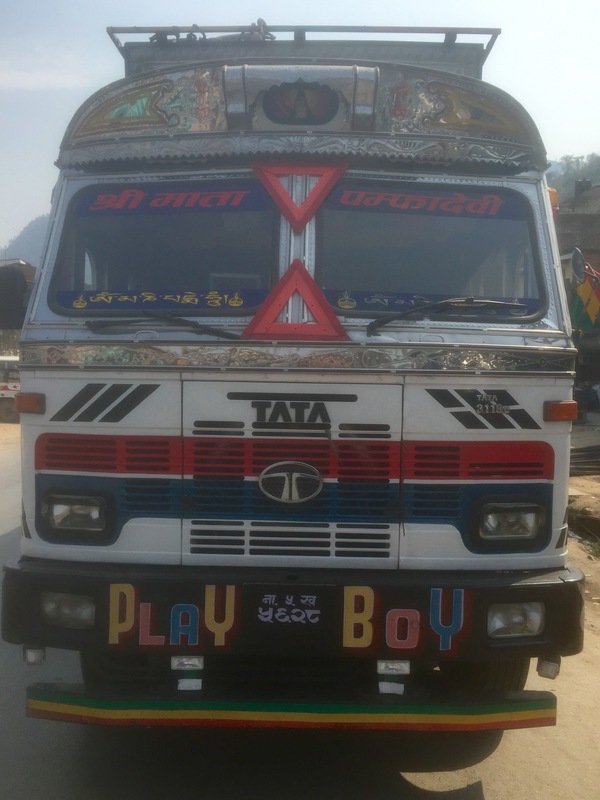 The road is dominated by huge Tata trucks with massive chrome fronts which are wonderfully decorated with paint, ribbons, images of shiva, nicknames, one even had the images of the starting lineup for Real Madrid. I opted to take a tour bus as they are larger, less crowded, and are reputed to have good maintenance– read: the brakes work. Definitely was not going to fly as the local airlines have had two major crashes in as many days. The Green Line is maybe the most expensive, but it left from a point just across from my hotel (saved taxi fare) and included lunch at a riverside resort which was pretty much the fanciest place I’ve been in since arriving. Still, the trip to Dumre (my transfer point) took six hours. My seat partner was a man from Spain on his way to work seasonal labor in New Zealand, and the guy behind me was from London on his way to start a new job in Hong Kong. Nice folks. Even though it was a highway, the bus did have to stop several times while people herded goats across. At one of those points, I could see a man slaughtering a goat on the side of the raid. I was the only one to get off in Dumre where I was taken in hand by Chris, one of those people who offer to help out and generally at some point get a decent tip. We sat in a cool restaurant for the hour between buses, me drinking a beer and he telling stories of being a guide on the circuit. Out the window in the back I could see people doing their laundry in the river. Particularly interesting was a couple– she worked on the clothes while he washed two large incredibly beautiful wool patterned rugs. One was a blue I’d never really seen, which he scrubbed carefully in the current of the river. The minibus I got from Dumre to Besishahar was a standard 15 passenger van with 26 people (including baggage) in it. The road was still paved, but was increasingly narrow which did nothing to dampen the driver’s enthusiasm for acceleration and horn blowing. Besishahar was the last large town, and I finally got the bus Nadi — a classic Nepal bus with loud music, lots of tassels, and people crammed in every possible spot. Lots of stuff ends up on the roof with the ticket taker climbing up while the bus is moving. We passed one bus that I thought had a person riding up there, but it was two goats. No idea how they got up there or why they stayed. The surface of the road gave out and the third bus did not go much faster than I can walk. Techincally that section was part of the circuit, but it is an industrial area where a large Chinese company is building a hydro electric plant. All the guides say not to walk it and I’m glad I took the bus to a point just about the project. A man on the bus recommended I stay in a guest house just north of Nadi at the foot of a huge steel swinging bridge. A really great guest house run by Hari who is studying Korean language. Sat by the river for a while, then had a beer and curry. As I ate I could see lights in some of the buildings with people gathered around, then someone began playing a flute that was so plaintive it was almost like listening bagpipes. Then someone played one of those small fiddle/guitars they have. The music echoed around while I finished dinner, getting me ready for a good night’s sleep.